Two Dots: you will have more fun when you compete for high scores, stars and medals! Make Two Dots more fun with friendly competition! We agree that Two Dots is a fun game. If you want more fun from the game, then you must compete for medals, total stars, and high scores on each level. I have walk-through videos on YouTube. 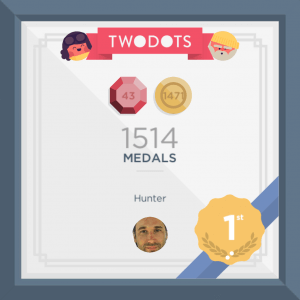 As of today, I have 1514 Two Dots medals. Can you beat me? 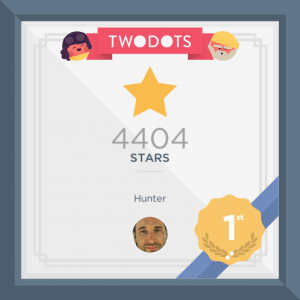 As of today, I have 4404 Two Dots stars. Can you beat me? To compete with each other, we must be Facebook friends. It doesn’t matter what language you use for Two Dots or Facebook: we only need to be friends. Legal notices: Nothing here means Playdots, Inc. (“Dots”) endorses me, likes me, or endorses this website. Dots owns Two Dots, their logos, trademarks, copyrights, trade secrets, source code, intellectual property, personal problems, and artwork—except when they don’t own it. I am not claiming I own any of it. I mean, if you believed the holiday celebration would be great if you invited 1) both of your parents, 2) their new spouses, 3) your second spouse’s parents, and 4) their new spouses, I am not responsible for the results—you own that. If you don’t believe me, then ask your therapist. I am not affiliated with Dots. Dots has no control over, and assumes no responsibility for, the content, accuracy, privacy policies, or practices of or opinions expressed in any third party websites or by any third party . . . .